Powerful, yet easy to use. Featuring dynamic toolbar throughout the tool, image list overview, presets, and many more details which help you be more productive while maintaining your images. All standard image formats supported, including WIM, decrypted ESD (Electronic Software Download) and SWM (spanned, split images). ESD to WIM, SWM to WIM (aka image joinining), WIM to SWM (aka image splitting) conversions included. Tool can create a bootable ISO from any of them, if the normal image folder structure is present (e.g. Boot and Sources folders). And you can edit images in all supported host combinations, for example editing Windows 10 image from a Windows 7 as a host is supported. Analysis option advises on some of the more common issues, dependencies or recommendations for certain KB updates. Integrate drivers into the image, Windows automatically installs only the detected ones on deployment. Also features “Import host” functionality, which pulls and integrates host drivers into the image. Then option like “Exclude unused”, which removes drivers from the integration queue which are not detected as needed for the selected hardware list. Drivers can also be integrated to the boot image (boot.wim, Setup), so that they are available on USB/ISO boot. Making it possible to integrate and use USB3 or SATA controller drivers which would otherwise be unsupported, depending on the Windows version. NTLite can gather host machine hardware list and use it in all of its features. Hardware target checklist is a particularly helpful feature, allowing you to see in advance for any missing drivers on the resulting deployment before applying changes. This enables you to target other machines when preparing an image, while trying to reach the minimum deployment size or maximum compatibility. You can also extract drivers from an image or an existing install. Also provides direct hive editing for manual changes. Easily change various Windows settings on your live installation or an image, like pagefile settings or various Explorer UI settings, to name a few. Also you can pre-configure Windows Features, same as you would in Control Panel – Programs – Turn Windows features on or off, but before deployment. Windows Unattended feature support, providing many commonly used options on a single page for easy and fully automated setup. Multiple-choice options are presented with valid entries read from the source itself. Includes Auto-fill option, which fills the choices with the current Host machine data, allowing for fast configuration.Add local accounts, choosing usernames and passwords in advance, autologon any of them after install. Network join, which allows you to automatically join to a Workgroup or a Domain after installation. Disk partitioning, which speeds up the deployment by automatically formatting and partitioning your drives. All the pending changes and important warnings are presented on a single page for quick review before actually applying those changes. With the ability to enable extra options or automate post-process tasks, like creating an ISO image, compressing to ESD format, splitting the image. 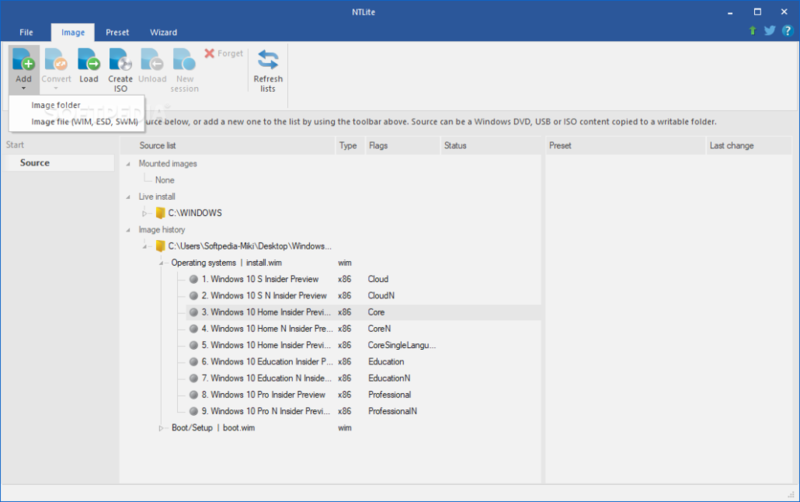 Extra options include “Clean update backup”, which removes obsolete updates, and “Reuse driver cache”, which relinks drivers with the driver cache, utilizing NTFS links to reduce the actual disk size by reusing duplicate files. NTLite does not require .NET Framework or any other addition to run under the supported operating systems. This enables it to run faster, more portable with less dependencies. Supported Windows versions include client Windows 7, 8, 8.1 and 10. Not including XP and Vista versions. 64 and 32-bit versions can edit both 64 and 32-bit images.